Last week, I gave you 20 Tips on Running with a Jogging Stroller, and if you're running with a stroller, having one that's meant to run with is a must. Today, I'm going to give you advice on how to chose a good jogging stroller if you don't already have one, or if you're looking to replace what you do have. First of all, if your budget will allow, just go ahead and buy any of the BOB brand jogging strollers that does not have a fixed front wheel. One of those can handle pretty much anything you throw at it and you don't need to read anymore of this post. BOB, you can thank me for that plug by sending me a duallie free of charge. If you're like me and have a more limited budget, read on. When shopping for a jogging stroller, you want to look for terms like "jogging" or "jogger," in the model name. Though, not all may say that, it's a good place to start. A good jogging stroller will have pneumatic tires similar to those on a bicycle, meaning they have tubes and you have to fill them with air. Yes, this means a little more maintenance, but strollers with plastic or other non-inflatable tires, will not work well and won't last long for running. A single jogging stroller should have one tire in the front and two in the back, none of those double wheels like on an umbrella stroller. A double may have two tires in the front, which provides a little more stability over uneven terrain, but it's okay if it only has one. The front wheel of a jogging stroller should either be fixed (meaning it does not swivel at all) or have a locking mechanism. If you plan on using your stroller strictly for running, then a fixed front wheel will work fine and these strollers are often more affordable. However, if you want to use the same stroller at an amusement park or while shopping, look for one that swivels with the ability to lock into a fixed position. A fixed front wheel is very difficult to make turns with while walking, a jogging stroller with a front wheel that swivels is a dream to turn. A note on shopping with a double jogging stroller: The handicapped accessibility act requires all public places to have doorways that can accommodate a wheelchair, and every double jogger I've looked at (which is a LOT) is made to fit these dimensions. However, not all places are wheelchair/stroller friendly. You might think you can't fit through a doorway somewhere, but chances are you really can with some extra effort. I used to get stuck sometimes, but after learning how to do it (it helps to lift up on the handle as the back tires go through), I've yet to meet a doorway I couldn't make it through. The scratch on the wall outside of the Victoria's Secret changing room may disagree, but hey, I made it in there! When I went to Dillard's yesterday, the nice lady told me she didn't have a room I could get the stroller into. I wanted be all "psshhh lady, I can totes make it through there," but I just took the kids out and left the stroller. I only talk like that in my head, by the way. Making it between racks in a store is another story though. If the racks have wheels you can move them aside and move them back and nice employees will help you with that. If they can't easily be moved, you're stuck leaving the stroller in a wider aisle while you browse. Not really a big deal, just worth sharing. Anyway, back to running. 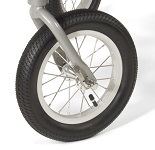 A good stroller will have a rubber or foam grip on the handlebar and most will have adjustable height handlebars. You don't need cup holders if you're only using the stroller for running since nothing will stay in them. The seats should have adjustable 5-point harnesses that are securely attached (padded harnesses are a plus). Check for hard parts that your child could possibly hit their head on if they're jostled from side to side. This doesn't rule that stroller out, it just means you need to take precautions to prevent injuries. If you plan on doing some really serious running with your stroller or if you live in a hilly area, look for one that has a handbrake. A handbrake on a stroller is just like a bicycle brake and the handle is attached to your handlebar. You may think this is overkill for a stroller, but once you've ran with a stroller at a decent speed or have gone down a hill, you'll realized how useful this brake is. Even the lighter jogging strollers are still heavy and they can really pick up momentum. I wish my stroller had a handbrake, but they are more expensive. (lightbulb! I could install one myself!) 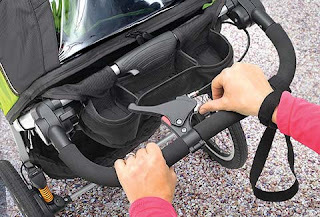 The stroller should also have a strap attached to the rear axle that you put around your wrist or hold in your hand, in case the stroller does get away from you. Weight is another thing to consider when shopping for a jogging stroller. Once again, BOBs are a winner in this department, they also tend to be narrower and can more easily fit through doorways. My double stroller weighs over 50lbs, my two smallest children combined are over 50lbs. That's 100 extra pounds I'm pushing! The BOB Revolution SE Duallie is only 34lbs and the single version is 25lbs. My single Baby Trend jogger is 26lbs, so when going for a single stroller, you don't save much weight by spending more on the BOB. 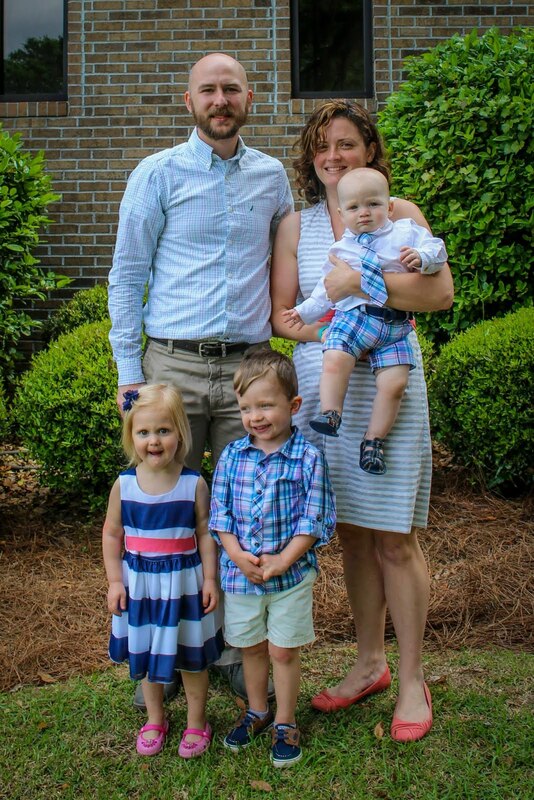 Along with weight is size, I already talked about maneuverability through stores but you also need to consider the ability to fit the stroller in your vehicle. My double stroller is a tight fit in the back of my van. Most manufacturers provide dimensions of the stroller in it's folded position, so make sure to check that and test it out if you can. 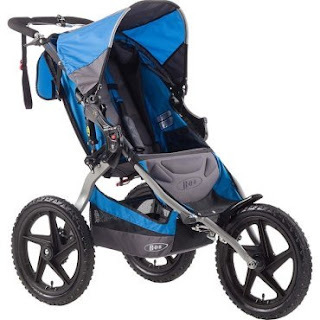 A lot of jogging strollers have suspension (shock or shock absorbers) systems. Some are even adjustable. I'm pro-shocks; some may argue that if you're only using the stroller on paved paths or roads you don't need them and if all paves surfaces were smooth, they would be right. Around here we have some pretty bumpy sidewalks and roads and the shocks can keep your kids from getting jarred too much. 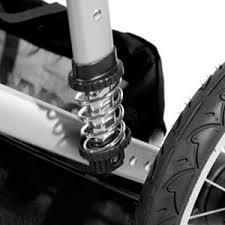 If you plan to use the stroller off-road at all, you definitely want shocks. Perhaps the most important research you can do before purchasing a jogging stroller is the test run. If possible you want to be able to push the stroller around and even run with it a little (with kids in it!) to see how it handles for you. If you're ordering online and it's not possible to check the same model out in person make sure the retailer has free returns in case it doesn't work out for you. Once you've found the right stroller, make sure to check out my tips on running with it! That's it! I hope you've found this post helpful in your search for a good jogging stroller. Did I miss anything? If you have any questions, let me know in the comments below, I'll be happy to help.